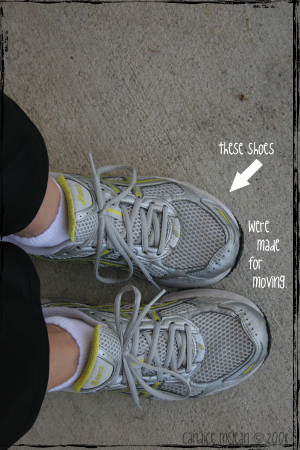 photo of the day - these shoes. 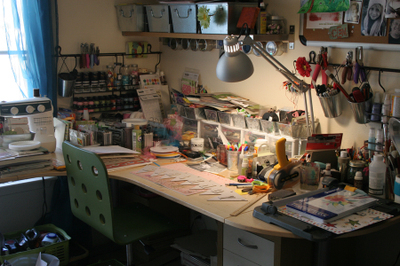 here's a peek at my very messy desk. why am i sharing this with you? no good reason. just in the mood to share my mess. did you notice? 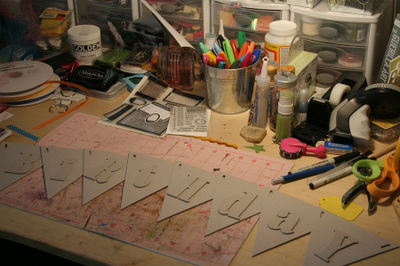 i did clear a spot in the middle to begin a new project - a birthday banner. so i was planning to make a birthday banner for my girls. tate and roan both celebrated their birthdays in early april - tate turned 7 and roan turned 9. well, i never made the banners. bad mommy. good intentions though. anyhow, we celebrated the birthdays back to back - sat and sun. i was exhausted on monday. 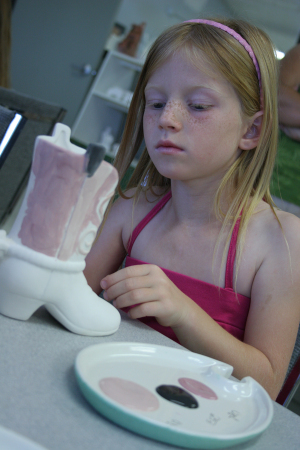 tate chose to have a pottery painting birthday party - she had 17 kiddos attend and they each chose a piece of pottery and painted it. they also listened and danced to some music. silly, silly, silly dancing. ate some cake and she opened her presents. she scored some really cool gifts and yes more webkinz! the girls LOVE webkinz. roan decided to do a trail ride here at the base stables then return to our home for a bbq. 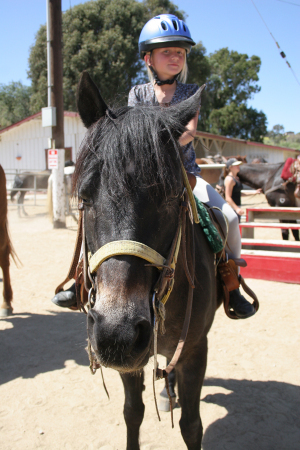 i joined the girls on the trail ride - an hour ride in the hot sun. it just happened to be a record high that day. whew! parents of the girls joined us at the house for the bbq and it was so much fun. we had burgers, hot dogs and pulled pork bbq sandwiches. a few of my good friends brought sides to share - a delicious corn souffle and a cool cucumber salad - so yummy! since it was too hot, chip put up the water slide for the kiddos. we also rented a jumpee so the kids were in total heaven playing in the backyard. roan also received some wonderful gifts and yes - more webkinz. oh my! where will we keep all of these furry little creatures? 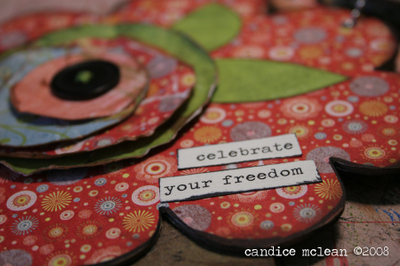 inspired - have you seen candice carpenter's banners? i'm so inspired by her beautiful and detailed work. she has taught a few classes at ever after scrapbooks and unfortunately i have not been able to attend. off teaching or attending soccer games. anyhow, she has a really cool combination of a vintage chic and retro vibe going on. check her out. new album workshop - GO TEAM! 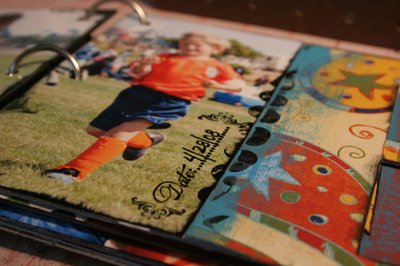 i'm teaching a new album workshop on sat, may 10th from 10am to 1pm at ever after scrapbooks in carlsbad. call EA today to signup or to purchase a kit at 760/433/9313. the album title is GO TEAM! and we'll be use the bobunny TEAM word art album and the bobunny lucky paper collection. love this new paper collection! digging the bright and vivid color palette and love the star and paisley designs. 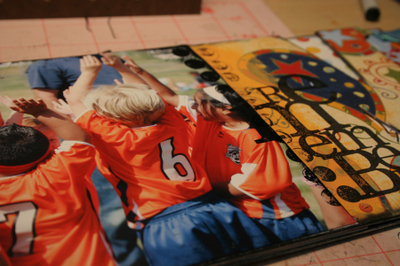 for the subject - i used all of my favorite photos of connor from his spring soccer season. [side note] we just finished our last game of the spring season yesterday. it was so much fun watching him grow as a player. love how is confidence is improving. some funny reflections from the season - of course the two games that i missed were the funniest, but chip and connor told me about them both. lady bug infestation. on this day, there were tons and tons of lady bugs covering the fields. all of the little guys chased the lady bugs throughout the game - both teams. not much soccer playing that day. the reenactment of the this was too funny! and then there was the day of the beautiful girl. connor was very distracted by a little girl with long brown piggy tales with pretty little red bows that matched her red jersey. this is connor, "mom. there was a beautiful girl at the game today. she was on the other team. she had pretty long brown hair and red bows! and she was so - ugh! - beautiful." at "ugh" he paused and threw his hand onto his cheek. chip said he followed the beautiful girl around the field and the two talked throughout the entire game. he missed a few plays and the ball literally went right by him. too cute! here's a quick sneak peek of the album GO TEAM! please note! i'm no longer cemdesign.typepad.com. please add my new blog name and email address to your bookmarks and addy book. i'm currently working on a new look for my blog and i can't wait to unveil it. hope you all are well. keep checking back. many hugs! new look - new name - coming soon! 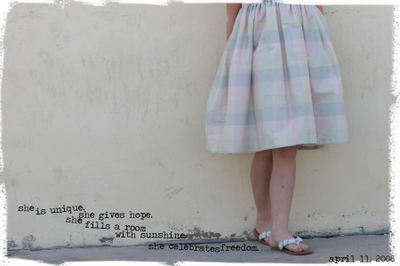 i'm updating the blog with a new look and a name change. 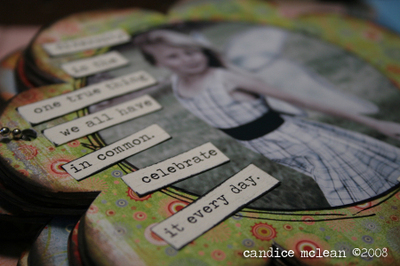 my new blog will be candicemclean.typepad.com and i'll announce the official date soon. 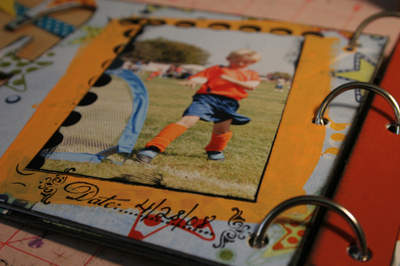 this sunday, april 20th 11am to 2pm at ever after scrapbooks in carlsbad, ca. call EA today to signup for the workshop or to purchase a kit. 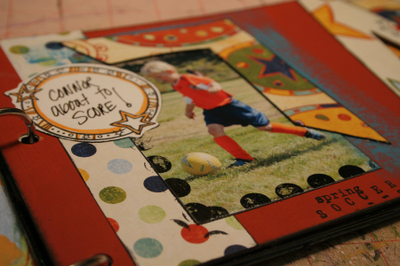 760/433/9313 kit comes with detailed written instructions and color handouts. kay. still having some computer headaches. i do not have access to my email accounts on my old pc so if you are on my email list or would like to be on my email list, please email me at candicemclean@mac.com. thank you for your patience if you have been waiting for an email from me. haPPy BirTHday to mY Tee tEE!!!!!! today is tate's birthday. 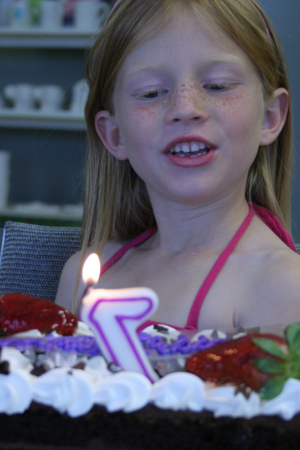 she is 7 years old today. man, time goes by too fast. we are celebrating her birthday this weekend at the hobby shop on base. we have invited her entire class and a few friends from the hood. she is so excited!!! 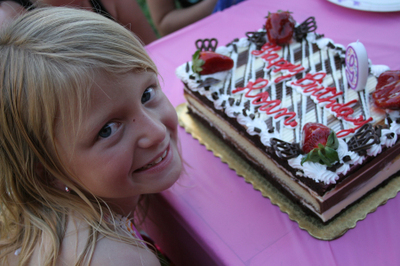 we'll paint ceramics and eat yummy cake - her favorite - double, double chocolate layered cake. so off to make her a very special breakfast. help! i cannot for the life of me figure out my wireless network for my pc. i have the mac and the airport extreme set up and they are working beautifully together; however, i cannot get the pc to connect to the internet or receive/send email. i installed a wireless adapter to the pc, and the pc recognizes the network and even shows a strong signal, but i still cannot connect to the internet. this is killing me. over two weeks now trying to figure this out and still no luck. why i'm so frustrated? i'd like to upload all my old files from the pc to the mac via my idisk server. anyone out there who may be able to help? please send me an email at cemdesigns@cox.net. 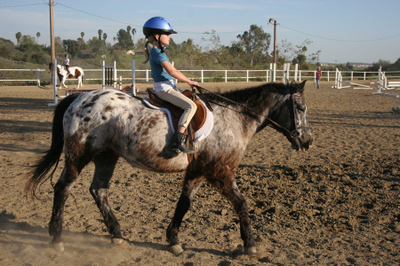 here is tate and dennie just finishing a riding lesson. and here is roan and dennie together. dennie is 28 years old and one of the sweetest horses ever. she was born at stepp stables on board the camp pendleton base. most of the original horses born on base are long gone. i think its just dennie and her sister left. 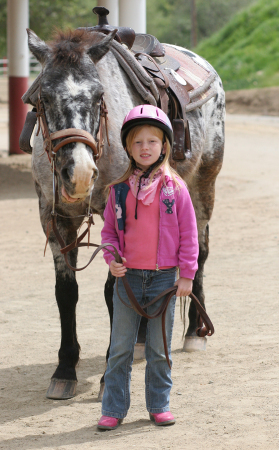 both girls, tate and roan, share dennie for riding lessons. they have been riding now since november and they both are doing really well. tate rides western and roan rides english. bitten by the horse bug, they both keep after me for their own horse. if they only knew how expensive horses are and the cost to maintain them. for now, we'll keep up the lessons. and maybe one day, after the military life, we'll settle down somewhere and have a few horses. i can picture it now. open fields of green grass, a little house tucked away under some old maples and off a bit in the distance, a little barn with a couple of horses. a small vegetable garden off to the side bearing yummy fruits and veggies. oh, and i would love my own chickens too. a girl with a dream.